Cupcakes 'n Daisies: Diary of A Crazy Woman . . . . So I got all the red corners sewn on the last of my Door County Cherry Baskets. Next step, finding the perfect place for each basket in this assortment of 64 baskets. 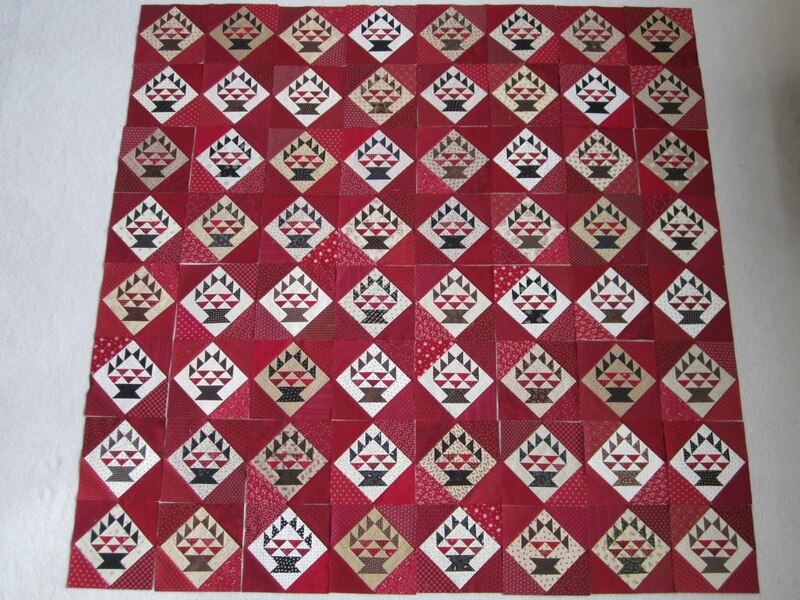 Here's what I had to juggle; I wanted to alternate the black and brown baskets, have no two background fabrics next to each other, and have absolutely no like red fabrics touching. 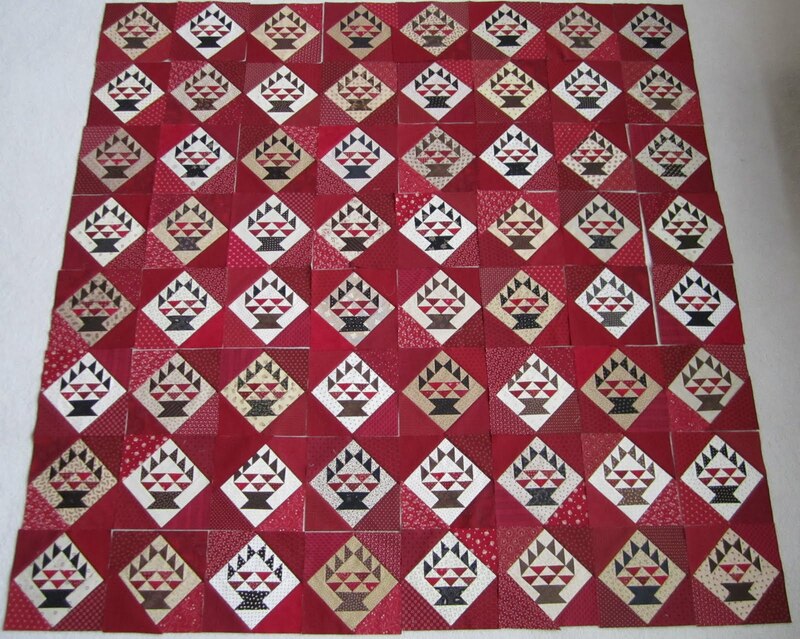 I used different red fabric for the black basket blocks and the brown basket blocks, making it impossible to have two like red fabrics touching side to side, but not diagonally. So mainly focussing on alternating the brown and black basket blocks and the red corner fabric I came up with this layout. At this point I decided I needed to give more thought to the background fabric so I moved a few blocks, keeping with the alternating black and brown plan and the no like red plan. And came up with this, which just didn't feel right to me. It was the background fabric that was still bugging me. So I came up with this idea. To chart the position of each light, medium and dark background fabric. Then I looked for rows of like toned background fabric and marked them on this grid, green is dark, orange is medium, red is light. Then I identified the blocks that I thought I should move to improve the overall look of things. And pulled them out of the mix. Here's where I went wrong, I forgot to consider my alternating brown and black basket plan. I thought if I could just rearrange these 9 blocks I would be good. But I didn't have equal numbers of brown and black basket blocks. So I was left with this. Which I still didn't think was quite right, SO I STARTED OVER!! then the problems identified. 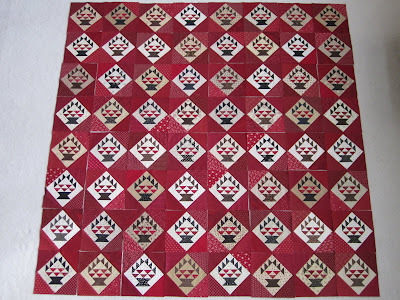 This time I only moved one identified block at a time, paying closer attention to the black and brown basket fabric and not paying so much attention to the red corners. which I decided I could live with. There were a couple of like reds in the same area, so instead of moving the blocks again, I decided I would just put new red corners on the lawbreaking blocks. 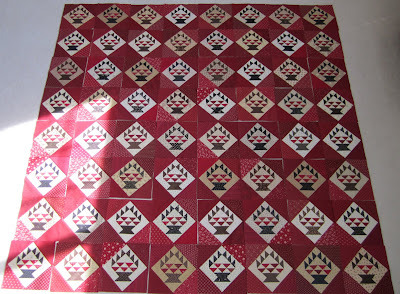 Help me Rhonda if I get some of these blocks mixed up while sewing them together, wish me luck! Wow! That sounds like a crazy amount of work! I actually couldn't tell a difference from your pictures, but I imagine it must be more obvious up close? Or at least it is to you. I can be very particular at times too, but if you're going to go to all the work of making a quilt, you want to be pleased with the end result. Good luck sewing it together! I like you last layout. The darker background blocks don't seem so noticeable. 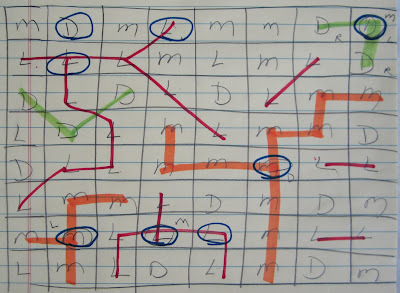 I've never thought of charting my blocks when trying to figure out the layout - will definitely keep it in mind. Lovely quilt - love all the red ! Your charts look like a football play! But glad it all worked out....your quilt is just wonderful! I'm really looking forward to seeing it finished. The difference is very subtle and is probably more noticeable in real life. 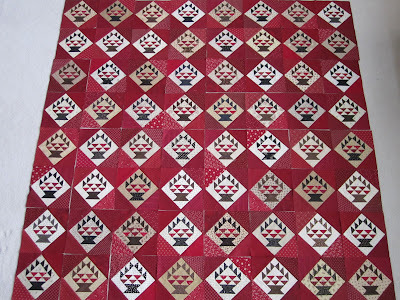 I think one of the things that make your quilts so spectacular is the effort you put into color placement and in the design changes you typically make. How are you keeping it all organized while you're sewing it together? Thelma, you are obsessed! Your layouts look great, all of them, but the most important thing is that you have found one that you like. I like it, too - that's a great pattern and your quilt is going to work up just fabulous! heee :) Good job! I like the grid idea when it's hard to work with the fussiness. This is going to be absolutely gorgeous. 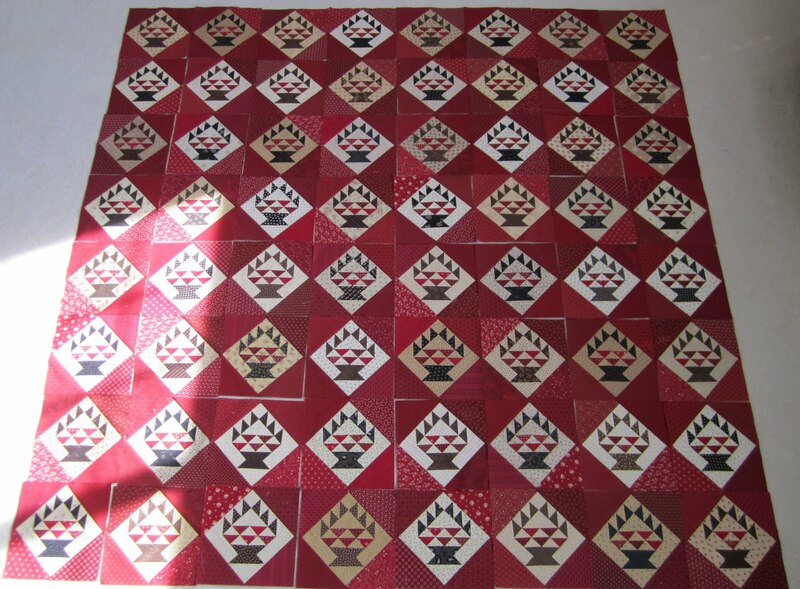 This is my favorite part of the quilting process -- I love laying out blocks for final assembly! I love it when fellow quilters are OCD -- I mean CDO, in alphabetical order like it should be!! LOL -- just a little bit, like me! LOL I, too, would be obsessive about likes touching and even distribution of lights/meds/darks...Great work!! This is why you don't make ugly quilts -- and why it's such a joy to visit you here!! Oh my goodness Thelma! 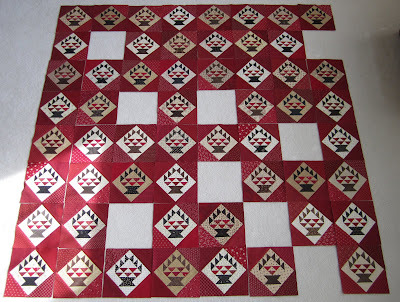 I could not keep up with you on this one...you are way more brilliant that most quilters to figure out a layout using these strategies. Wish you could come over and help me with my Indian Orange Peel layout! It's so beautiful! I rely completely on my daughter for block placement. She has never failed me yet! OMG! Reading your post felt like I was laying out my own quilt! Obsessed much? Not at all. There are somethings that just need to be done! LOL! Love Love Love It!! You may have OCD but you are amazing at what you do. 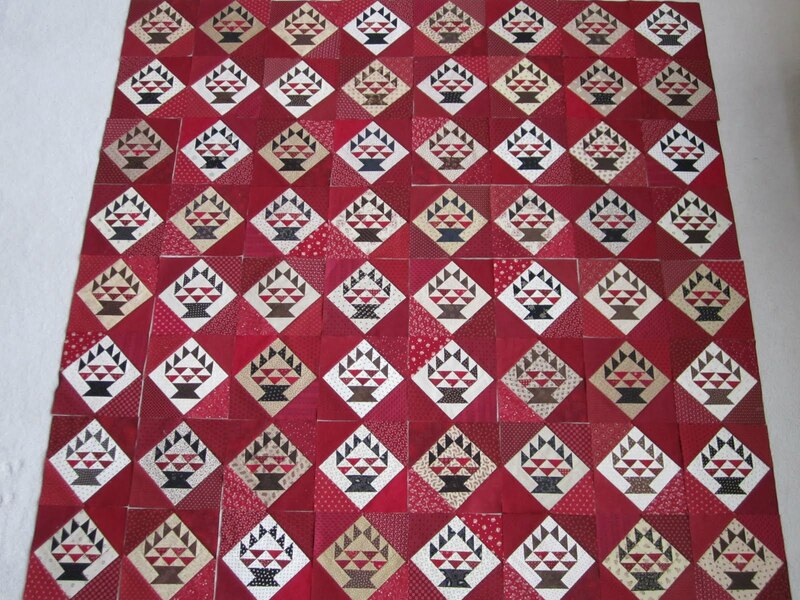 This quilt is amazing and so is your process. I love it! Wow, I am amazed at all of the work you did to ge the layout just right. I'm sure it will be just what you want when it's done. I love the baskets! It's going to be wonderful and it's nice to know there are other crazy people out there - not tried a grid before though, other than to keep it all straight while I'm piecing it together! I am worn out from reading how you figured it all out! LOL You amaze me! I am the same way about not wanting the same fabrics next to each other but sometimes you just have to! Your quilt is gorgeous no matter how you lay it out! Truly a work of art! Gorgeous! Ha! Thelma you are one crazy quilter! (the good kind of crazy!) The end result it beautiful but that amount of work shifting all the blocks around would have sent me over the edge. Glad you are happy with the results. It must be much more noticeable in real life, because in these photos I cannot see a huge difference. Your grids are hilarious! I wouldn't stress out over this; the blocks are beautiful. If you can't see two matching fabrics side by side as you pass by on a galloping horse, it's just fine. Crazy? 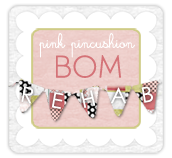 :-) Welcome to my world! LOL I think it will look wonderful no matter which way you organize the blocks! Very interesting! I enjoyed all the layouts. They may look similar but I know that fabric definitely photographs different than it looks a lot of the time. 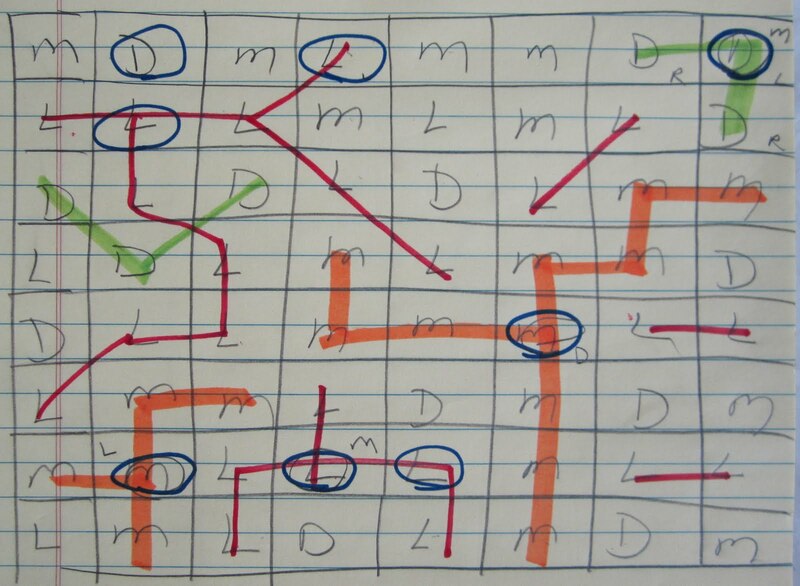 Your grids looked like the on screen ones when they chart football plays on T.V. -- John Madden's going to be jealous!! The blocks look great Thelma and I liked the first layout but could see the differences in impact when you started moving the blocks around. 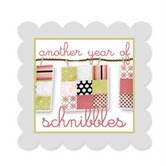 Glad you got them to where you like them and this will be a pretty addition to the lifetime quilt list!